Vox Cantoris: The SSPX: "But if it be of God, you cannot overthrow it." The SSPX: "But if it be of God, you cannot overthrow it." This writer does not attend the Society of St. Pius X chapel in Toronto. On Sundays, Vox and Fox drive two hours and two dioceses away to assist in developing the community there in a properly offered traditional Latin liturgy, with Gregorian chant and organ. Our choir is growing, mostly young women, our organist, at 13, can perform on the organ, and the community can sing, Mass I, II, III, IV, VI, VIII, IX, XI, XII, XV, XVII and Credo I-VI plus the Marian antiphons and sprinkling rites. That is the labour that this writer attends to on Sundays, it is tiring and it is greatly rewarding to see how the community is growing. It is a humble group of faith. No rancour. No polemics. Only the gift by God to allow me to see where the future will be as we pass on to others what we have been given. In full disclosure, in the past, between other cantor appointments and at other times on special request when their regular director was not available, I have assisted at the Toronto Chapel of The Transfiguration. I have great respect for what they have accomplished across southern Ontario from the St. Michael's Priory. I was a great honour to have been part of the Schola that sang the requiems for Father Nicholas Gruner and Father Stephen Somerville. I have great respect for the Society of St. Pius X and its priests and bishops. Without them, there would be on traditional Mass. The slander that they continue to put up with by people within the novus ordo culture is regrettable. When it comes by those lay pretenders to tradition, it is even more deplorable. One day when the Church emerges from this darkness, She will acknowledge before God and man the error that overwhelmed Her. She will condemn these and declare them anathema. Then, She will acknowledge the legacy of Archbishop Marcel Lefebvre and "restore all things in Christ." When one views the pictures below and at the link, I defy anyone to state that this is not the work of God. This would not be happening if the Holy Spirit were not directing it. To fail to see this is to be blind. This is not to say that the SSPX is the "Church," but that the SSPX is within the "Church." Those who deride them are wrong and do not know scripture. ACTS 5: 38. And now, therefore, I say to you, refrain from these men, and let them alone; for if this council or this work be of men, it will come to nought; 39. But if it be of God, you cannot overthrow it, lest perhaps you be found even to fight against God. And they consented to him. Thank you, friend Vox, for this uplifting post. A terrific post in supporting the Fraternity and giving it the recognition it deserves. Mirabile dictu. God bless you for what you are doing. You are helping! You are doing what you can to pass on the faith intact. What a wonderful thing to be able to offer the Lord. Those pictures are simply beautiful. We have no SSPX near us. I wish that we did. I suppose the men who do not subscribe to heresy and won't support it would be outside of the Church now. Who should we follow, heresy, or the men who are holding fast to the faith. God help us, Our Lady of Fatima, intercede for us. Quattuor abhinc annos, the first Mass Indult was issued in 1984, four years before Mons Lefebvre was excommunicated for consecrating his own Bishops. His Bishops are entirely in opposition to Tradition and they have no Jurisdiction as they were aught but vagus Bishops intruding into the jurisdiction of already legitimate Catholic Bishops who had jurisdiction and were in communion with the Pope- once the sine qua non of Catholicism - before lefevbre and his renegade revolutionaries struck at the heart of unity. And so he is routinely praised by those claiming to be traditionalists.. But, that is not evidence of diabolical delusion - O, no. 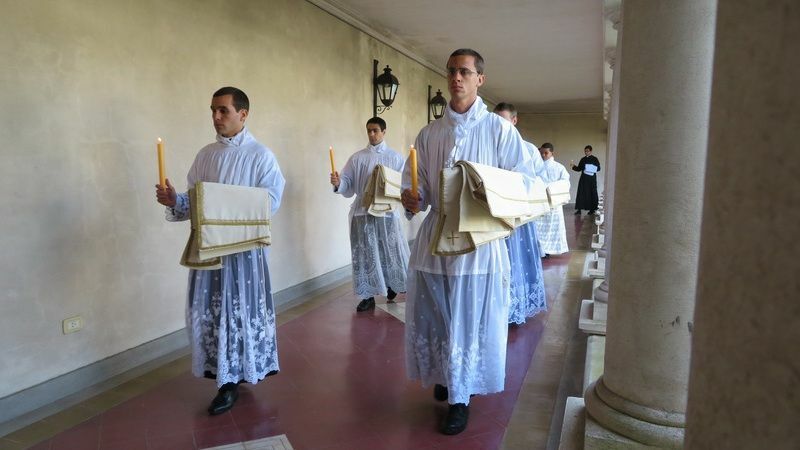 SSPX has 18 seminarians in Argentina. Bergoglio's huge Buenos Aires Archdiocese may have two NO seminarians. By their fruits . . . Thank you, Vox. The SSPX is my lifeline. Funny you mention ordinations at the end. Abp Lefebrve worried that after V2 the priesthood would be lost. That was his impetus for carrying on his mission. His initial reaction was to reordain the priests that came from the NO church. The Abp recognized grave doubts that the new ordination rites of 1968 were deficient in expressing the priesthood and mostly the episcopate. That said, why wouldn't you go to the closer SSPX chapel on Sunday where you are assured of proper apostolic succession and make the 2 hour drive where the ordinations have doubt? I attend an SSPX parish. It has five priests and two brothers. There is a huge new church, an academy and a very active retreat center. Demoralized novus ordo Catholics are flocking to us the longer Jorge Bergoglio reigns.The Holy Ghost clearly provides guidance and protection. If you are anywhere near an SSPX parish or chapel, walk in, feel the presence of Almighty God again and never look back. The apostates in the hierarchy today merely occupy traditional Catholic real estate. They are not Christ's Church. The N.O. Mass is a radical departure from Tradition. The design of the N.O.Mass was heavily influenced by Freemasons and Protestants. Such was the result of heavy Communist infiltration into the hierarchy. These are all facts easily come upon, if you would take some time to read accurate history of VII. Archbishop Lefebvre was a real bishop, one who stood his ground and protected his flock, unlike the rest of the effeminate, pleasure loving wimps we now call bishops. JPII helped usher in this current state of disaster, with his awful liturgical for us Masses, Koran kissing, and eccumenical destruction of Faith. If you take time to read a Baltimore Catechism, you would know that JPII had some seriously erroneous and wacko ideas. No one knows who is or isn't in heaven, but according to the Tradition of the Faith of the Fathers, "Saint" and JPII don't go together. Archbishop Lefebvre will one day be recognized for his heroism in keeping the Faith alive. The diabolical disorientation is in the N.O. sect, with its illicit Mass, and all the souls it is leading to hell through the loss of Faith and false teachings of its many heretical hierarchy. Such Beautiful pix, Vox! I can almost feel the reverence! Thank you so much and for your article!